The DeathAdder and Mamba both serve larger handed gamers, the DeathAdder is slightly larger being a little taller and longer but they're pretty similar shapes overall. I don't think you can go wrong with either shape. Buttons are a draw, they both have a slight pretravel that does deaden the tactility a little bit. The Mamba Wireless has the advantage in performance overall by being wireless, it'll be a lot better to control with no cable in the way. 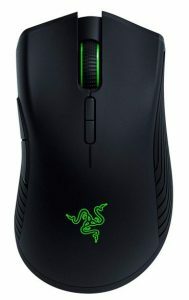 There's no real advantage to the DeathAdder over the Mamba other than it being a more frugal option. If you desire wireless, you can rest assured that the Mamba Wireless is a great alternative to the DeathAdder Elite.